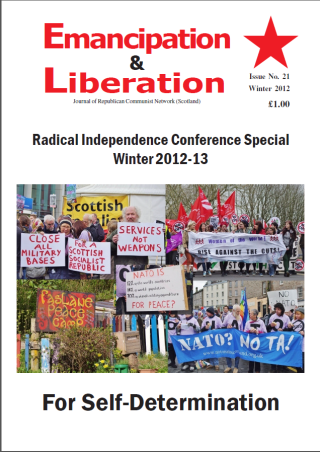 We are posting a new link to an electronic version of the special issue of Emancipation & Liberation the RCN produced for last year’s Radical Independence Conference. This will provide some basis for assessing the changes which have occurred in the political situation in Scotland over the last year, and how RIC has met the new challenges. Mary McGregor, who lives in Dundee, has written the following tribute to the acclaimed singer songwriter, Michael Marra, who died on October 23rd. Every obituary and tribute to Michael Marra seems to begin with I met Michael in… or I have known Michael since … and when I sat down to write about him, I realised that that was how I too wanted to begin. Michael was weel kent and it must have been around 1976/77 when I first met him playing with the Dundee band of truly talented musicians called Skeets Boliver. Since then, our lives and paths have crossed and weaved and no matter how many years passed since I saw him last, he always remembered me or at least had the good grace to pretend to. I always found him a kind and gentle man steeped in politics, culture and history. 1) Another world is possible – a joyful, creative, new world communism which emancipates us all from oppression and frees us all from exploitation, and which forms a new sustainable relationship between humanity and the environment. Socialism is not the ultimate aim. It can either be a phase on the way to communism or a temporary high point reached before a descent back into capitalism. The new society will have no resemblance to the statist autocracy of the Soviet Union, and will go well beyond the welfare state of social democracy. 2) We champion ‘being’ over ‘having’. The ruling classes attempt to maintain control over us by stifling both individuality and cooperation through the creation and marketing of false needs. This culture of consumerism represses our collective attempts to assert ourselves and gain control of our lives. Nevertheless, alternatives to this are constantly being explored, for example in the sphere of the creative arts. As a source of pleasure and power, they are a vital part of our struggle to help build a new society. Lina Christou, who lives in Athens, explains the background to the current crisis in Greece. Greece has been chosen by the ‘graduates’ of the Chicago school as a country in which the ‘Shock Doctrine’ approach could be applied in the way this is described in Naomi Klein’s book (1). This is because Greece is the European Union’s weakest link and can serve as a point of entry for the IMF into the European Union. The weaknesses of the Greek state – evident since its creation in 1830 – were intensified after World War Two due to the interference of foreign powers, and were not even overcome after the end of the military Junta in 1974. The parties, which governed the country after 1974, succumbed to the temptation of clientelist politics with all the distortions and corruption that this generates. During this period, the Left was marginalised within the formal political system despite wide popular support, whilst the majority of the media were dependent upon the political establishment and their dirty money. In the end the country was brought to an unprecedented economic, political and social crisis. Jim Slaven of the James Connolly Society highlights some of the publicly unacknowledged features of the 2014 referendum, how they fit into the British ruling class strategy to maintain its rule over these islands, and a new challenge to this in Ireland. Murdo Richie explains the consequences of the SNP conference decision on NATO. We are being deceived into thinking that we are safe with NATO-friendly nationalists when instead we have a disgraceful pretence, (1) claims Lord NATO alias its former General-Secretary and former UK Defence secretary, George Robertson. Torn between his former position recognising the SNP Conference decision as the right thing and his hatred of the SNP he calls them politically dishonest . Adding none of the new countries that joined NATO ever rejected the nuclear umbrella, he cites the Strategic Concept adopted last year. Ewan Robertson, who currently lives in Venezuela, writing for Venezuela Analysis , asks us to imagine what radical independence could look like. With two years to go until the SNP puts an independence referendum to the Scottish people, the likelihood appears that the form of independence on offer will look more like devolution-max ; ditching any policy that would either prove unacceptable to ruling elites across the UK and further afield, or would bring meaningful sovereignty and political participation to an independent Scotland. In this context, it is worth considering what examples of radical independence exist in the world today, and how much it’s possible to achieve given the right conditions and political will. In this article, I invite you to imagine what a radical independent Scotland would look like if took some influence from Venezuela’s ‘Bolivarian revolution’, and to consider just how meek is the proposal for independence we currently have on the table compared to the Venezuelan experience. Susan Dorazio places Scottish independence firmly within the struggle for global emancipation and liberation against capitalist and patriarchal exploitation and oppression. A Socialist and Feminist Republican Scotland would establish equality for women, but it wouldn’t stop there. Scots, no matter how gender-identified, would recognise that liberation and justice for one is liberation and justice for all. A socialist and feminist republican Scotland would be our part of a global transformation of all aspects of society as we now know it – a revolutionary process underway today, from the streets of Greece and Spain, to the schools for young women in Pakistan, to the family planning/abortion clinic in Belfast. We the undersigned call for an independent Scottish republic built on the principles of liberty, equality, diversity and solidarity. These principles can never be put into practice while Scotland remains subordinate to the hierarchical and anti-democratic institutions of the British State. The Republican Communist Network supports the creation of an independent Scottish Socialist Republic as a significant step towards communism. We look to and would support a Federation of European Socialist States. Our support is for a genuinely independent Republic, not a sham façade that presents a Scottish nationalism that settles for symbols, not substance. A politically independent Scotland cannot be won primarily through a vote, but rather by building a mass movement that takes its demands to the streets, and creates genuinely democratic institutions by the people and for the people. A fully independent Scotland is one that is not subject to the UK’s Crown Powers and does not recognise the monarchy; a fully independent Scotland would have a banking system controlled by the people and not the Bank of England or the European Central Bank. A fully independent Scotland is one free of all foreign military bases, including the Faslane Naval Base; one that is outside of NATO, because this is an imperialist alliance dominated by the United States For an independent Scottish Socialist Republic of America and supported by British imperialism. A fully independent Scotland would reject the bankers’ top-down internationalism, because this drives the EU’s current austerity agenda in Europe. We need a new European unity based on internationalism from below. Our vision of an independent Scotland is very different from the ‘independence” advocated by the SNP. In the two years until the referendum, we hope to work with others who share our vision of an independent Scottish Republic and are not willing to hand the SNP a blank cheque. We know that Alex Salmond is already bargaining behind closed doors, reassuring the ruling class, here and abroad, that the SNP can deliver an ‘independent’ Scotland subservient to business interests. When the time comes, we will determine how we will vote, given the options presented, but for now our role is to organize around a Socialist vision of independence. Help to achieve this!